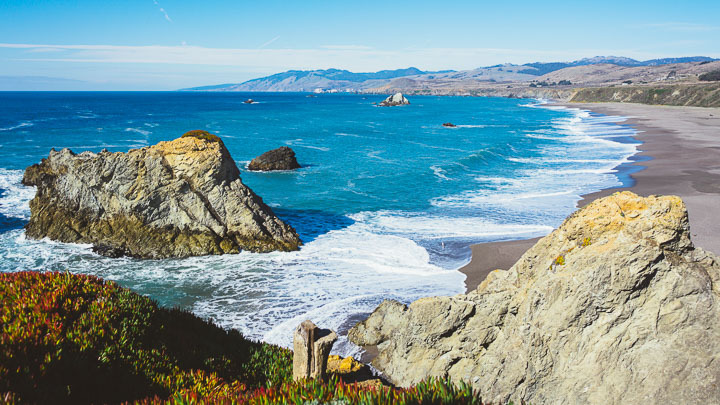 Your guides will meet you in San Francisco, and we’ll transfer you north across the Golden Gate Bridge to Marin County. Begin with the essentials: a bike fitting, safety talk, and map review before tasting cheeses at Marin French Cheese company. Our ride will take us past Sonoma’s rural ranches and pastoral farms. The biggest climb of the week comes early, but is rewarded with beautiful views of Tomales Bay. 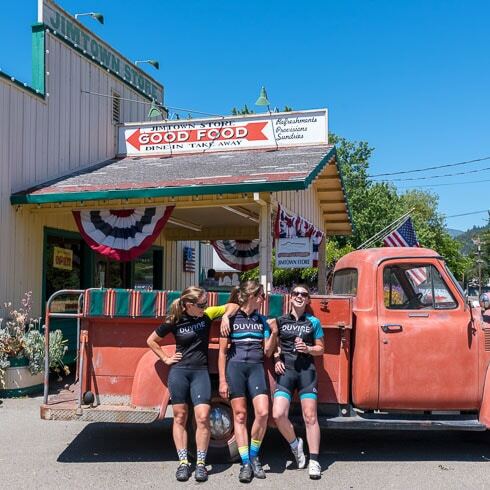 After lunch at a local cyclists’ hangout, we’ll continue to our favorite bakery, then choose a van transfer or continue a few more miles on the bike to the Bodega Bay Lodge. Tonight, we kick off the tour with an exquisite meal at Michelin-starred Terrapin Creek. 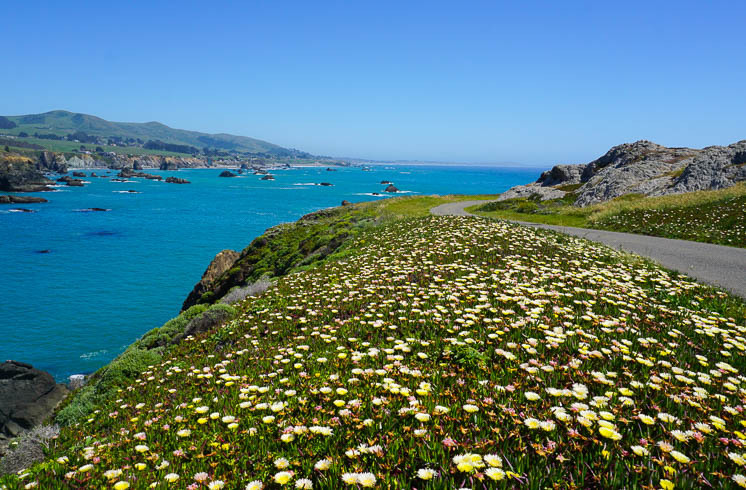 Today’s ride highlights the variety of Northern California: start by pedaling past the rugged headlands of the Pacific coast and pause for a photo against a backdrop of rocky cliffs and dramatic, cresting waves. After a coffee stop, we veer east along the Russian River and arrive at a redwood forest. Marvel at these mystical 1,400-year-old trees, then picnic beneath their 300-foot canopy. En route to Healdsburg, we’ll stop on the historic West Side Road to taste crisp Chardonnays and velvety Pinot Noirs at a standout winery. Our favorite Healdsburg restaurant hosts us for dinner this evening. This morning, ride West Dry Creek Road in a region replete with welcoming vineyards. As we cross into Alexander Valley, quiet backroads reveal dreamy views of the Mayacamas Mountains, and we’ll stop for a coffee amidst acres of vines. Lunch is served at a favorite outdoor sandwich shop before we return to the hotel for an afternoon by the pool. 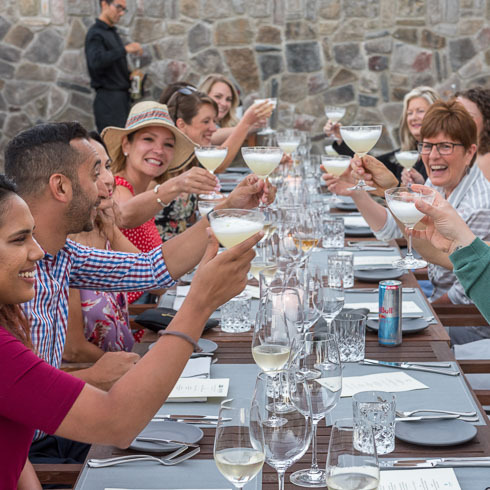 Tonight is your free night—take advantage of the 30+ tasting rooms lining Healdsburg’s historic square, and turn to your guides for a dinner recommendation to suit your tastes. Bid Healdsburg farewell this morning as we pass once more through the Russian River Valley. This time, we’ll continue east on Chalk Hill Road, an eight-mile stretch lined with pastures, stables, and celebrated vineyards. 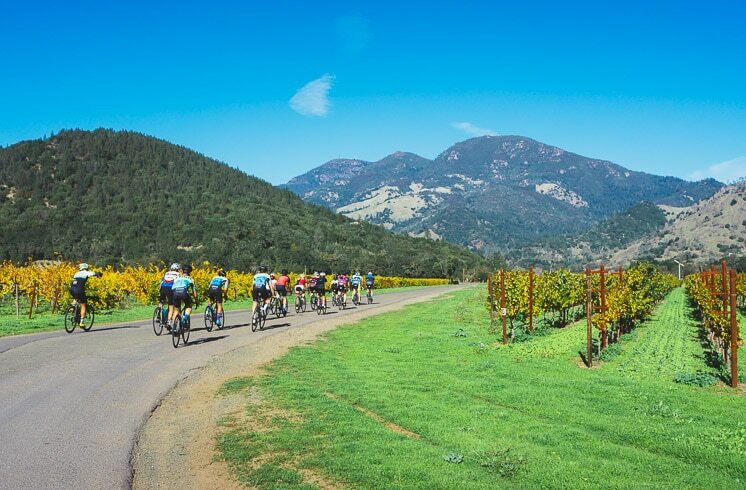 Turn towards Napa Valley where the road opens up with views of Mount St. Helena, and finish the ride with an epic lunch. This afternoon, settle into your next hotel—a stunning spa property in Calistoga—with a well-deserved massage, or explore the perfectly manicured town before dinner on your own. 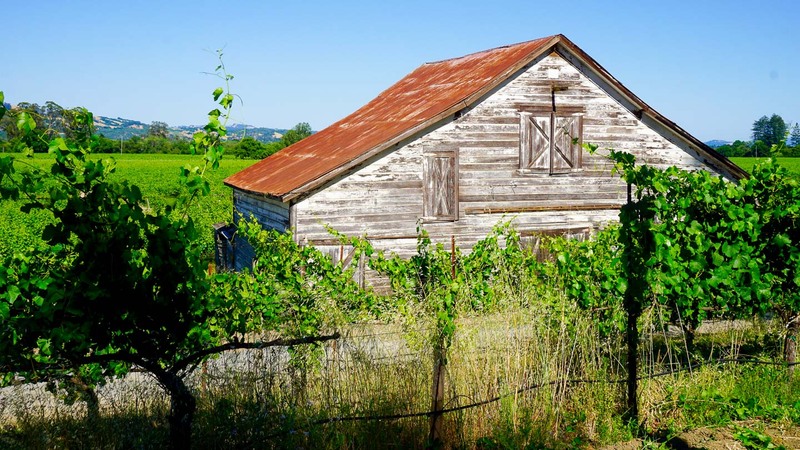 The focus of our day is discovering a side of Napa that remains relatively untapped. 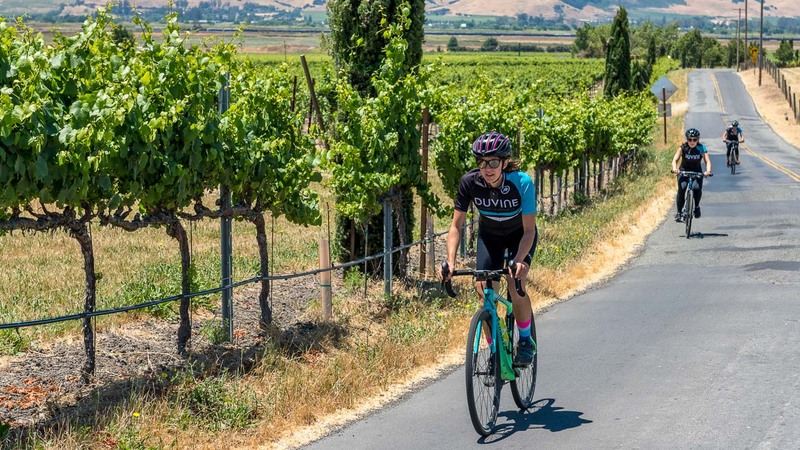 Begin by riding the Silverado Trail, a road with a dedicated bike lane running its entire length, then climb out of the valley into a classic Northern California chaparral. At Grove 45 Olive Oil, our friends Bonnie and Nena welcome you for a tasting and lunch. Afterwards, there’s a bit more climbing before we break into a downhill past Lake Hennessy and into St. Helena. Perhaps our favorite surprise of the week is the beer tasting hosted by Nile in his St. Helena brewery, Mad Fritz. 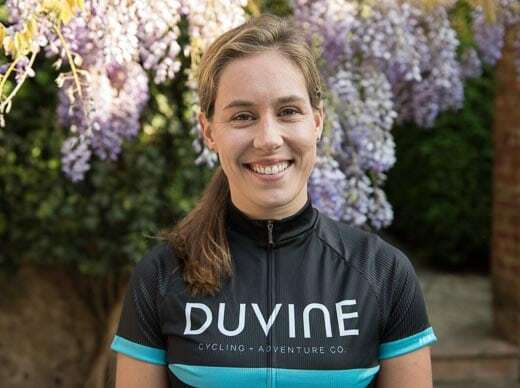 With your palate primed in both olive oil and beer, choose to keep riding, transfer back to the hotel, or explore the shops and tasting rooms of St. Helena. This evening’s epic final dinner is an affair to remember at Solbar, the hotel’s Michelin-starred restaurant. On your final morning, join your guides for an invigorating morning ride or sleep in and linger over one last poolside breakfast. 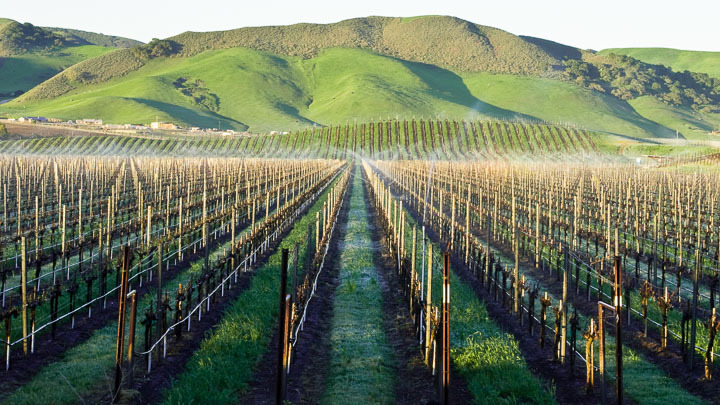 Around mid-morning, your guides will drive you back to San Francisco via Napa Valley for a final, sweeping overview of some of the region’s most famous vineyards. Or, we can help with alternate transportation if you plan to stay a little longer in Napa. 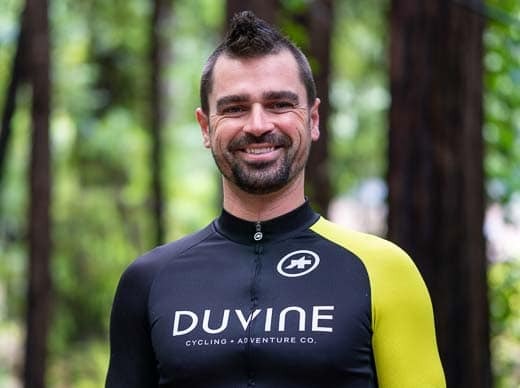 DuVine searches for the most scenic roads that simultaneously offer ideal riding conditions. In Napa and Sonoma, some roads are popular with motorists and cyclists alike. Our routes may include short sections on busier roads, but the support van is always available if you wish to avoid stretches with heavier traffic. If you are flying out on the last day of the tour, please do not reserve your flight before 4:30 pm as there is only one transfer back to San Francisco from the last hotel. IMPORTANT: It is possible that where and when your tour starts and ends can change. Please contact your tour coordinator before you finalize any plans.